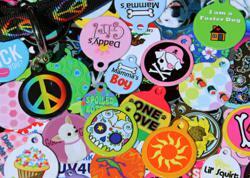 Custom pet ID tag company ‘Dog Tag Art’ seeks creative minds to design high-quality pet tags. Dog Tag Art is offering an additively fun way for artists and designers to promote their original works on virtually indestructible pet ID tags. Dog Tag Art, a company specializing in custom pet ID tag, is on the lookout for new artists to design one-of-a-kind pet tags for their online store. Dog Tag Art features artists' unique designs and user submitted art and photography which are printed onto pet ID tags in their Asheville, NC facility and shipped within 24 hours. Dog Tag Art is offering an additively fun way for artists and designers to promote their original works on virtually indestructible pet ID tags. For any graphic design artists looking for new ways to share their work, Dog Tag Art has an open call to designers to become a featured tag artist. If selected by Dog Tag Art staff, featured artists will have their designs promoted via the Dog Tag Art website and social media and earn $1 commission for each tag sold. These specially crafted, unique design picks will also have a featured profile on the Dog Tag Art website that links back to their personal website or portfolio. Top artists can earn over $100/month on commissions as well, making it not only a great way to promote artwork but an easy way to add a little weekend spending money to the bank. Curious artists seeking to be featured on the Dog Tag Art website must first create a User account. After registering, designers can employ the ‘Tag Design Submission Tool’ to begin creating customized pet ID tag designs for Dog Tag Art's consideration. Pet lovers and owners don't have to become a featured artist or professional designer to create custom pet ID tags for their furry companions. Dog Tag Art's ‘Custom Tag Creator’ allows anyone to purchase a one-of-a-kind self-made ID tag. Established in 2008, Dog Tag Art is the original place for personalized pet ID tags that allow pet owners to upload artwork or photography to create unique pet ID tags. Create your own custom dog id tags or view all pet id tags in our online gallery. For more information on commissioned designs, visit our Become a Pet ID Tag Artist page.